Cox: For our readers who may not know you well, could you tell us about yourself and your career achievements that led to your appointment as the first female Secretary of the Interior? Secretary Norton: I grew up on the outskirts of Denver, enjoying firsthand the great outdoors in the Rocky Mountains. I went to college and law school and began my professional life there. My most significant achievement was being elected Attorney General for the State of Colorado in 1990, and serving for eight years. Earlier in my career, I worked in Washington, D.C., at the Department of Agriculture and then the Department of the Interior as Associate Solicitor for Conservation and Wildlife. There, I gained significant experience relating to the management and preservation of public lands and environmental protection--particularly in the implementation of the Endangered Species Act and working to preserve parks and refuges. Later, as Attorney General, I worked closely with state agencies to achieve consensus on issues that impacted Colorado while serving as an advocate for state interests. I`ve always been committed to finding opportunities for consultation and collaboration with states, local communities and stakeholders. The Interior Department manages approximately one in every five acres across this country, which includes 387 National Park units and 544 wildlife refuges. President Bush and I believe that to advance conservation, promoting partnerships with the American people is the best way to achieve our goals. With our partners, we have restored millions of acres of habitat; removed invasive exotic species; replanted native grasses; improved riparian habitat along thousands of miles of stream; conserved limited water resources; and developed conservation plans for endangered species and their habitat. Cox: During your first weeks as Secretary of the Interior, you framed your agenda under the banner of "Communication, consultation and cooperation, all in the service of conservation." How do the interests of sportsmen fit within that philosophy? Secretary Norton: Sportsmen are the unsung conservation heroes. Sportsmen improve wildlife habitat by purchasing sporting equipment including firearms, archery equipment, fishing tackle and ammunition. With each purchase, funds go to Pittman-Robertson and related programs that support wildlife restoration and sport fish enhancement. Their purchase of duck stamps also provides funds for wildlife refuge acquisition. We just celebrated the National Wildlife Refuge System`s centennial. History teaches us that hunters--with Teddy Roosevelt at the forefront--were the ones who recognized the need to conserve wildlife and set aside lands for habitat. I remind people at every opportunity of hunters` important contribution to conservation. In the course of advancing a culture of responsibility, by focusing conservation on community cooperation and voluntary action, the Interior Department is working with the American people to achieve healthy lands and thriving communities across the nation. Conservation requires more than action by the Federal government alone. By partnering with states, tribes, community organizations, hunting and fishing groups, and individual citizens, Interior is achieving conservation through cooperation, communication and consultation. By taking responsibility for the local lands where they live, work and play, citizen stewards are working with us to preserve habitat for wildlife and recreation while maintaining working landscapes. We`re listening to all voices and involving all citizens. Cox: In the Clinton Administration, sportsmen were not welcomed into departmental dialogue concerning land use decisions and policies affecting hunters and anglers. How has the department`s relationship with sportsmen changed under your leadership? Secretary Norton: Hunting and fishing conservation groups represent millions of hunters and anglers, who as a group generate more than $70 billion in economic activity annually. We continue to work hard to make sure the perspective of America`s sportsmen and women is considered as we make decisions on important issues that affect the activities they cherish. I have met with conservation groups consistently throughout the last three years, most notably last December where I addressed several groups at a meeting with President Bush at the White House on conservation issues. "We recently celebrated the centennial of the National Wildlife Refuge System. History teaches us that hunters--with [NRA Life member] Teddy Roosevelt at the forefront--were the ones who recognized the need to conserve wildlife and set aside lands for habitat." The Fish and Wildlife Service, under the leadership of Director Steve Williams, early on brought together more than 35 hunting conservation groups including state fish and wildlife agencies. We continue to strengthen those conservation partnerships in a way that benefits fish and wildlife. In the last year, Director Williams has done the same with more than two dozen bird conservation groups and many of the nation`s best known land trusts organizations. On another front, the department is working with hunters and anglers to ensure that habitat needs are being met through a number of important partnership programs including the North American Wetlands Conservation Program, and the Landowner Incentive Program. Director Williams has appointed hunting and fishing coordinators as well. What`s more, we are actively seeking the input of citizens as we develop conservation plans for our refuge units that will determine future management of wildlife-dependent recreation including hunting and fishing. Cox: One of the key reasons that hunters cite for not going afield is fewer places to hunt. What has the Bush Administration done to provide increased access and hunting opportunities on federal lands? Secretary Norton: The Depart-ment of Interior has expanded hunting and fishing programs on 50 National Wildlife Refuges under the Bush Administration. Where the service has established hunting and fishing programs access always is a key part of the program. Director Williams also has appointed hunting and fishing coordinators in the service`s refuges and fisheries programs. As the service`s refuge managers develop comprehensive conservation plans that will guide how each refuge is managed over the next 10 to 15 years, we are looking to involve hunters and anglers at the local level among many others who are interested in wildlife-dependent recreation. Cox: Last September NRA Executive Vice President Wayne LaPierre signed a Memorandum of Understanding with two of your agencies, the Fish and Wildlife Service and the Bureau of Land Management, to support the need for a coordinated effort to improve access for hunters and anglers to federal lands. What have BLM and FWS done since then to implement the Sportsmen`s Access to Federal Public Lands MOU? Secretary Norton: The Department of the Interior signed a memorandum of understanding with 17 organizations that represent the interests of hunters and anglers across this country. The U.S. Fish and Wildlife Service, Bureau of Land Management, the Forest Service and our partners are working to improve access for hunters and anglers on public lands. Under the agreement, these organizations agree to encourage local chapters and affiliated organizations to contact and meet with appropriate agencies` field offices and to participate in agency land use planning efforts, when plans are open for comment; encourage local chapters and affiliated organizations to provide leadership, services and materials for the maintenance of roads, trails and access points on public lands; inform the agencies of potential grant opportunities that might provide sources of funding for hunting or angling access related projects; provide technology and support to improve the delivery of information about hunting and angling access; and offer support to facilitate the acquisition of easements for roads and trails across private lands that are necessary to improve access to public lands. The MOU signatories will meet in September to assess progress and continue efforts to fulfill the goals set in terms of improving access to public lands for hunting, fishing, boating and other forms of outdoor recreation. Cox: Several years ago, NRA led the fight to reform the government`s management of the sportsmen`s trust funds that use excise tax dollars on firearms, ammunition, and archery and fishing equipment to fund state wildlife, fisheries and hunter education programs. What has taken place to ensure that these reforms are implemented by the Fish and Wildlife Service? Secretary Norton: Since the Federal Aid Improvement Act was signed into law, we have moved to implement its provisions to ensure that the Sportsman`s Trust Funds are managed efficiently to enhance partnerships we have built over seven decades with sportsmen and women and state fish and wildlife agencies. The Service takes very seriously its role in supporting conservation and working with state fish and wildlife agencies and other partners. These trust funds are vitally important. The Service launched the new Firearm and Bowhunter Education and Safety Program. This program apportions $8 million annually to the States for enhancing the existing hunter education program funded under the Wildlife and Sportfish Restoration Acts. The former Administration Grant Program was eliminated and replaced by a well-coordinated, transparent $6 million Multi State Grant Program managed in concert with the International Association of Fish and Wildlife Agencies and all state fish and wildlife agencies. $11 million has been returned to the states as a result of increased efficiencies and a nationwide staff reduction from 140 employees to 104. The state audit program has been re-engineered to provide appropriate oversight and accountability. A report called the Wildlife and Sportfish Restoration Program Update is available at http://federalaid.fws.gov. Cox: In recent years, federal lands have been closed to recreational shooting. This is of special concern in areas where opportunities are unavailable on state or private land. As Secretary of the Interior, what can you do to ensure that recreational shooting continues as a legitimate and traditional activity on our federal lands? "I remind people at every opportunity of hunters` important contribution to conservation,",Secretary Norton said. Secretary Norton: The BLM is fully committed to accommodating recreational shooting on the public lands as part of its multiple-use mandate. There are currently more than 100 shooting ranges operated under Recreation and Public Purpose leases on public lands throughout the West that help meet the increasing demand for places to practice shooting sports, as well as providing important training for security personnel. In addition to these ranges, the vast majority of public lands are still open to recreational shooting and hunting. When public outdoor shooting ranges have been closed, their closures are usually the result of issues associated with urban growth, watershed and air-quality concerns, safety and other reasons. Ranges originally located on the outskirts of cities have been closed due to noise and safety concerns raised by residents as development expands city limits. The BLM is committed to including recreational shooting interests as it implements its multiple-use mandate because this activity is a legitimate and appropriate use of the public lands. 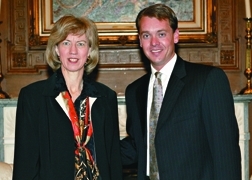 Cox: Under your direction, the Department has initiated several grant programs such as the Cooperative Conservation Challenge Cost Share and the Landowner Incentive Program that provide matching grant funds for wildlife conservation projects, in addition to already existing programs such as the North American Wetlands Conservation Program. Do these programs benefit game species? Do they help to create hunting opportunities? Secretary Norton: Over the past three years, the Department has provided more than $1.3 billion to support cooperative conservation programs. These include long-standing programs like the Partners for Fish and Wildlife program and the Coastal Program, which have successfully established productive relationships with communities, conservation partners, tribes and landowners while providing them with both financial and technical assistance. Over the past three years, these programs have together helped protect over a million acres in wetlands, uplands, and native grasslands and restore over 5,000 miles of stream and stream-side habitat. Our cooperative conservation programs also include new conservation initiatives such as the Landowner Incentive Program and the Private Stewardship Grants Program, which enhance habitat for at-risk species. These programs reflect a cooperative way of doing business working in partnership with private landowners. The response from landowners has been overwhelmingly positive. The President`s 2005 budget includes a $23 million increase for these programs. President Bush, in his budget request for 2005, has requested $54 million, the highest funding in history for the North American Wetlands Conservation Program. This internationally recognized program is very important for the conservation of waterfowl and other migratory birds. All of these efforts will help us in achieving the president`s goal, announced in April, of creating, improving, and protecting at least 3 million wetland acres over the next five years. Our cooperative programs involve thousands of partners, including NRA chapters, Ducks Unlimited, the Rocky Mountain Elk Foundation and the National Wild Turkey Federation. They benefit many species including ducks, geese, deer, turkey, songbirds and fish.